As an industry, occupancy is at an eight-year low. Senior living sales organizations continue to struggle. It’s time to try something different. It’s time to move beyond traditional sales techniques and to revolutionize how we sell. On this episode of the Senior Care Growth Show, Mike Marlow, Marketing and Sales Training Manager, Life Care Services, shares his advice on how to grow your business by building stronger connections with prospective residents and their families. Winston: Welcome to this episode of the Senior Care Growth Show. My name is Winston. Thanks for tuning in. I am super excited today to be joined by Mike Marlo. Mike is a marketing and sales training manager. He’s been working in the senior living industry for over 25 years, training staff and employees from all levels, from reps to executives. Today we’re going to talk about selling, not marketing, but selling your senior living services. Mike, Welcome to the Senior Care Growth Show. Mike: Thank you Winston. Glad to be here. Winston: So maybe just by way of introduction, you could tell folks a little bit about who you are and what it is that you do. Mike: Sure. I’m Mike Marlow. I just celebrated last month, 25 years in the wonderful world of senior living selling. I live in Louisville, Kentucky and I’m employed with Life Care Services as the marketing and sales training manager. Winston: That’s awesome. Let’s get folks up to speed. What would you say is the state of the senior living industry currently? Mike: You know, I do a lot of presentations, Winston and I asked that question every single time as the very first question because I want to know what the audience thinks about that and invariably I’ll get the same answer. In fact, I got it yesterday as I was making a presentation and that is “We’re doing great, we’re booming, things are really happening and they’re taking off.” And it’s interesting to me that they have that perspective because if we look at this from a pure statistical standpoint, we’re far from booming at this point. In fact, I’d like to share a few statistics with you if I could. Right now, as an overall industry, we’re in an eight-year low, at 87.9 percent occupied and that’s down .4 percent quarter over quarter. And these all come from the National Investment Center, NIC. Assisted living is at 85.2 percent occupied, a 13-year low and that’s down .6 percent quarter over quarter. Mike: Independent living is a little bit flat at 90.2, down .1 percent quarter over quarter. And memory care is at an all time low, at 82.2 percent occupied. So again, I’m always a little bit surprised that people within our industry don’t understand the difficulties that we’re facing right now. We also have one more statistic which is a little bit sobering as well and that is that for the last 10 quarters we have experienced declines. The only time that this has happened before was during the great recession of 2008/2009 when we actually decreased for 12 straight quarters. So things are tough out there right now. Winston: Wow, those are some sobering statistics. Why do you think that decline has happened? Mike: You know, I get into a lot of trouble with this Winston because I think sometimes the industry doesn’t always agree with me. But I asked that question as a follow-up question. I say, “You know, why do we think we are in these difficult times?” And I get the same three answers every single time no matter what group I’m speaking with. They’ll talk about increased competition, they’ll talk about increased costs and they’ll talk about the proliferation of Home Health and those answers are all 100 percent correct, but as a follow up question, I’ll ask the groups, “Which of those can we affect?” And the answer typically is, well we can’t really affect any of those and that’s correct. So, we really have to focus on what we can affect. I believe, and again, a little bit of trouble from time to time when people disagree me, but I believe the reason that we are in this difficult time is largely our own issues. That is because we have been really approaching our market and our customers incorrectly and I believe that we have some lessons to learn from some other industries. Mike: Specifically the tech industry. Steve jobs once made the statement of “We must think different if we’re to thrive in this industry of computing.” The same thing applies to senior living. We must think different. In fact, when I think about Apple and I think the intuitive nature of Apple products, I think that’s where we are as well. We have overcomplicated something in senior living selling, which is quite simple at its base. I just keep reflecting back on one of Steve Jobs’ famous quotes, “Innovation through simplification.” Sometimes innovation means subtracting; whereas, in our industry, when we get into a situation like this, we tend to add new sophisticated approaches to selling. Research tells us that’s really not the right way to approach it, so we need differently than we are thinking now and thinking in much more simple terms. Mike: Yeah, I love that quote from Steve Jobs. That’s one of my favorites too, I’ve referenced that before and talks. I think back to the image I’ve seen where it’s the design of the mouse, the computer mouse. It starts where it’s really complicated and has two buttons and a cord. Then the buttons go away and then the cord goes away and then you’re left with something like this, which is just a slab. It really the simplification of products and in this case services and how you deliver sales and marketing messaging. I think that’s a great point. So let’s talk a little bit about that and what do you see is the difference between marketing and sales in the senior living industry? We’ve had guests on the podcast talk about sort of the overlap between the two departments and how those things vary. What’s your position there? What do you think the difference is between marketing and sales? Mike: Well, I think it’s an interesting story because 25 years ago, last month I was recruited into this wonderful world of selling senior living. A gentleman who worked for a company on the west coast called me and he had seen me at a conference where I was one of the speakers. He knew that I had a ‘sales first’ approach and a philosophy. And 25 years ago, he said, we as an industry, a senior living industry are stuck as marketers, not sellers. And he said, do you think you would have any interest in talking to me further about perhaps moving us from a marketing based philosophy to a sales based philosophy? And my first question back to him was, well, what is senior living? I really didn’t know at the time I was selling something very different. Mike: I was selling wound care products as a matter of fact, but this gentleman was persistent and we got together and I worked for a company called Hilhaven. Which most of the people on your podcast probably have long forgotten, but it’s a company that was based in Tacoma, Washington, a skilled nursing company actually. And this gentleman again said we really need to grow up a little bit as an industry and move from marketing to selling. I’m a little bit disappointed to tell you that if you asked me today what’s the state of marketing versus sales, I’m not sure that we’ve changed a lot. We still are kind of stuck as marketers out there. There’s nothing wrong with marketing, but it reminds me of that definition of insanity of doing the same thing over and over and over again and expecting different results. Mike: Well, our results are pretty clear, we’re not moving in the right direction, so maybe we need to look at changing our approach from a more marketing based to a more selling base. Marketing truly is important and it produces inquiries and we must have those inquiries, but if we stop there, inquiries don’t produce any revenue for us at all. We have to focus on what selling philosophy do we utilize to turn those inquiries into move-ins, where we can actually see revenue produced and we can begin to serve our customers that move in with us. I think this ‘being stuck in this sea of sameness’ that we hear a lot in our industry, we’ve got to get out of the ‘marketing only’ realm and really become more professional salespeople. And again, it’s quite easy to do so it’s just that we’ve taken the wrong approach to doing that. Winston: Yeah, that’s a great point. Marketing certainly is important. We need leads, prospects, we need folks who are interested in moving in, but you have to help those people and convince them that maybe this is the right next step and take that salesperson mentality. And Mike we talked before the podcast a little bit about some research you had shared with me I thought was super interesting and maybe you could share with our listeners some of the research behind your sales methodologies. Mike: Have you ever heard this before? The more phone outs you make and the more tours you lead, the more your occupancy will grow. And every hand in the room will shoot up, “Yes, that’s what we’re doing. That’s what we’ve always heard.” I’ll challenge them. Where’s the research to back that up? And the interesting point is there is no research to back that up. It’s somewhat of an arbitrary approach that we’ve taken to selling senior living. Dr. Wylde says that’s inferior at best and wrong at worst. So what’s her approach to more words? Time and skills. She believes and I believe as well that we need to invest more time with fewer people for better results. So again, how do we operationalize that? We at Live Care Services have taken that and taken it to heart that we can only work- Dr. Wylde’s research says with only 10 to 12 prospects at any one time. We’ve taken it, made it a little bit simpler by saying we can only work with 10 prospects at one time and we ‘ve taken those 10 prospects and we’ve initiated something we call the ’10-3-1 board’. We focus on the 10 prospects, Winston, the 3 top needs of each of those prospects and the one personal connection that we can make. The personal connection is nothing more than hearing something personal about their life story and then taking action based on that. So we’ve utilized her research, focused on 10 prospects at a time, their top three needs and one personal connection we could make. But we’ve added a couple of twists to it that we think have made the operationalization of this even more effective. We’ve also listed under each one of these prospects, their key influencers, otherwise known as their adult children, otherwise known as customers. We know from research that 84 percent of the time it’s not the prospect making the final decision. It’s the adult children themselves. So we treat them as customers and we found out what they need from us as senior living providers. Mike: We find out what personal connection we may be able to make with them as well. We also include our department heads, typically our operational base, department heads. Once a day for just a few minutes, we bring those department heads in for really one purpose and that is to help us brainstorm on creative follow-up. Dr. Wylde says, ‘create a follow-up is missing in our industry’ and it’s critical that we follow-up with our customers. But, we know that sales doesn’t have all the answers, so we bring our department heads in and we encourage them to also help us come up with creative ideas for follow-ups so that we can truly serve these customers. We’ve had a lot of results with that, in fact, Dr. Wylde’s research says, if you will use the behavior based approach that she talks about, this ‘time and skills versus velocity and volume’, you can see a 45 to 50 percent conversion rate and that is a lot higher than our industry currently enjoys. Winston: Wow, that’s amazing. I love that approach and that idea. My first thought when you’re describing this is, as a salesperson, I have fewer leads to work. I get to dig a little bit deeper and actually build some relationships and help these people the right way, with such an important decision. And then my other thought is on the flip side of that, if I’m a customer and I’m choosing a senior living community, either for myself or for my parents, if I’m that adult child who’s choosing from my parents, that process has got to be better for the customer too, right? Maybe you could speak a little bit about that customer side and how do people choose the communities that they end up choosing? Mike: I always look outside of our industry for different ideas and John Maxwell is certainly a leading author in the leadership world. You know, he made the statement one time at a conference that I was at, he said, “We really only make five big decisions in our lifetime. And one of those five decisions is actually how we’re going to treat our seniors in their later years.” It surprised me a little bit because the other decisions were things such as marriage, career, children or no children and he lumped in ‘buying senior living’ basically into one of those five big decisions. So, we as an industry, we are selling something that is critically important and if we use a manipulative sales process-based approach, shame on us as an industry, we really need to do a better job and we need to understand why do people buy. Mike: So, to directly answer your question, Winston, research tells us that they buy for several reasons, but the top three arguably are they have to trust us. Trust is not engendered through a sales process. It’s engender through a way that we behave, the way that we treat customers as they’re going through this buying process. Interestingly enough, one of the other buying reasons that is cited in research is ‘how much interaction are prospects and their adult children seeing between our front line teams, which are people like C&A’s, dining room servers and those really frontline people that truly are the ones who serve our residents’. How much interaction they see between those individuals and our current residents. And lastly, value comes into play as well. So, we certainly need to understand what our customers value too, but let me go back to the first two for just a moment. Mike: That interaction between our frontline team members and our current residents, that’s so telling because what that is saying is that our customers really aren’t there to buy our community, what they’re really there to buy is the experience of our community. So let’s say they’re there for an hour and we think that we’ve got them focused on what we’re saying and the amenities that we’re sharing with them, research tells us that’s not correct. What they’re really focusing on is looking at this hour they are investing with us and on this experience that they’re working with us, they’re really looking at it as a dress rehearsal for the rest of their lives perhaps. So they were watching those frontline caregivers, they’re looking to see if they can trust us as salespeople because again, it’s that moment where they’re deciding ‘would I fit into this environment, would my mother fit into this environment?’ So we have to get away from sales processes that are manipulative and we have to start behaving in an atypical manner. Winston: Oh Man, I love that. I had a conversation recently about hiring the right staff for your marketing team and it came back to the culture and the values of the organization and making sure that those were really solid and strong. I think that that stuff filters through to the staff as well and showing that if you have those interactions with the residents of the community, if you’ve got people who are really engaged, that totally makes sense and so to your point, you’re not selling the amenities of the building or the layout of the room necessarily. While those things are important, what’s more important is what’s life going to be like here? And the people who were providing the care and services, what are they like and what is it like to interact with them? What an undervalued thing makes total sense now that we talk about it, but if you’re inside that organization, it might be hard to see that from inside out. Mike: That’s absolutely true. And. I’ll challenge our operational team members. I’ll say, who do you believe when a resident moves into our community and let’s say they’re there for four years, who are they going to develop a stronger relationship with, the sales department or the operations team? And the obvious answer is the operations team. At Life Care Services, we thought, why don’t we bring the operations team into this scenario because at the end of the day, this is a very intimate decision that our customers are making and we need to help them make the best decision possible for them. We know that since the operations team is such a critical link between their well-being and our residents, we need to bring them in earlier in the sales process so they can see what they’re actually buying. That is that level of commitment and that love of seniors that our operations team members do have. Mike: We believe that that’s an important aspect of it and it really supports the mantra that I have for the sales training program and that is, “isn’t it nice when the right thing to do?” And I certainly hope that you’re hearing that the way that we’re treating our customers during this buying process is the right thing to do but isn’t a nice when the right thing to do is also good for our business? We kind of win-win in this situation by changing our behaviors, thinking different and using Dr. Wylde’s research, we really can serve our customers much better that way. And, until we sell them, we can’t serve them, so we want to get them into the community and show them how life can truly be. Winston: Yeah, I think this is kind of a revolutionary sales approach. It’s like you said, it’s doing the right thing on all fronts. It’s better for the sales team, as they don’t as much clutter to sift through, they can focus on things, it’s better for the customer and they get the information they need in that hands on approach. And I like the idea too of bringing in the operations folks earlier in that sales process. That also helps them and has to be good for the operations folks to hear what the salesperson is selling and those values that they’re preaching so that they can live up to those things. That has to serve as sort of a constant reminder that we do take really good care of our residents, we do love these folks that are here and we want to provide the best life we can for them. Winston: Now Mike, let me ask you something, you mentioned competition earlier and stiff competition is one of the factors in the decline in occupancy rates. You also hear the term from time to time, kind of a ‘sea of sameness’, maybe you could tell me a little bit more about what that means to you and explain to our listeners what ‘sea of sameness’ means in the senior living industry. Mike: And then we as an industry look at that statement and we say things like, the Boomers are coming, the Gen X’ers are coming, the greatest generation is already here. And we treat people in these generational buckets. Well, think back to St. Francis’ quote, “The greatest hunger the human soul is to be understood.” That means that we need to take people out of generational buckets. I’m a Boomer and when I see people saying that Boomers need to be treated this way, that’s a sea of sameness’ kind of a statement, and I don’t recognize myself in many of the things that they say or many of the ways that they say they’re going to treat a Boomer. I’m an individual and until we break the mold of this ‘sea of sameness’ and understand that our salespeople’s first goal is to find out what is unique about this person. We can never create value for them, we can never create an experience versus giving a tour for that customer, we must break out of this sameness that we’re in and really look at our customers as unique. And then, present a unique experience to each one of these customers based on what we do find out does make them tick and what makes them a unique individual. Again, it’s a very intimate relationship between salesperson and customer. We need to embrace that uniqueness, that intimacy and understand that we need to invest the time to understand what’s important to them before we ever begin to talk about what we can provide for them. Winston: Yeah, that’s a great point. Let me ask you one thing, Mike, so you discussed behaviors earlier. How does selling behaviors coexist with selling processes and can those things coexist? How do those two things work together? Mike: You know, they can coexist if they’re in the right ratios, they can coexist. Again, research is very clear that a sales process is really overestimated, but atypical selling behaviors are underestimated. So we have to look at some specific behaviors, things such as listening skills and that is taught in every sales training program, but they’re missing half of the equation. Listening skills are important, but questioning skills are important also because we believe that at least 70 percent of the overall time that we invest with a customer needs to be invested in hearing their life story. And again, Dr. Wylde’s research backs that up. She says, before we do anything else, we must understand their life story. The behaviors of asking questions, asking a sequence of questions, listening very carefully to the answer and then crafting the experience to meet that customer’s needs., those are critical. Mike: Again, we have to re-define the customer perhaps because the customer is not just the prospect, the customer is also those adult children, which again, eight and a half times out of 10 are going to be the ones that are actually making the decision for those customers. We do need a selling proces also, and I challenge our sales team members within the first two weeks after someone has moved into our community, sit down with that resident and say, “thank you for choosing us. Can you tell me why you chose us?” That’s a great best practice because that’s market research and that’s the best market research that I can imagine because if one customer responds well to the approach that we took, we probably need to continue to use that approach with future prospects and their family members as well. Mike: I have never Winston had a salesperson come back to me and said, “you know, I asked that question Mike. I said, why did you choose us?” “And they said, you know, it was because of that great slick, sophisticated sales process at the salesperson used.” Nobody’s ever said that before, but what they do say is “I just seem to trust the people here. I don’t know why exactly, but I trusted them. They seem to really keep the promises that the sales team was making. It just seemed like the right environment.” So again, we de-emphasize our embracing of sales processes. They’re important, but they’re not critical. Behaviors are important and when we understand and utilize atypical selling behaviors, that’s the key to this. That makes us sleep really well at night as salespeople, because we know that we’ve done the right thing for our customers. Winston: Yeah. What a cool example of when you talk to those folks after they move in and they cite the trust that was built. The only way you can do that is through a really a consultative, empathetic sales process where you’re listening to that person. I did a sort of a secret shopper activity of my own and I reached out to a bunch of communities using their websites and the better ones did write back and say, “I want to hear a little bit more about your situation, let’s connect and I want to hear what you’re going through.” The ones that weren’t so good, messaged back to your exact point of “here are all of our amenities” and literally one of them was a bullet list of about 20 things in an email about all the features of that community. And they know nothing about me at this point. So, I think the leaders in the industry are the ones that are more consultative or taking the time and you can only do that if you change your processes and make those processes reinforce your behaviors. Mike: Some people think that’s really difficult and it takes a lot of time. What they don’t understand is that we need to embrace Dr. Wylde’s research and say this really works best when we’re only working with 10 families at a time and once we work with those 10 families, we can invest more time with those families and truly understand what they need and sometimes that even means that we’re going to say to that family, “we’re not the right provider for you.” We can’t say that unless we understand what they need from us. And I tell professional salespeople all the time, you will never be a truly professional salesperson until you’ve turned down business that you would love to have, but it wasn’t right for the customer. That’s the philosophy that we have at Life Care Services. We’re going to do the right thing for the customer every single time. Winston: Yeah, I love that. I think that should really be one of the core values, or at least somehow incorporated in the core values of pretty much any organization. It certainly is one of ours, but doing the right thing for the customer, even at the expense of revenue. Doing the right thing, making sure that they are in the right place because as you said, this is one of the top five biggest decisions of a life. Let me ask you one more question Mike, what are some of the biggest challenges that you see facing the senior living industry going forward? Mike: Well, I think I’ve said this before, but I’ll say it again, not everyone agrees with this answer that I’m going to give you, but it is my answer and I certainly believe that it’s true, I’ve always believed it’s true and now research does back it up. I think there’s a couple of things. First of all, we have to get away from the generational buckets and we have to understand that people are people. And the more time that we invest in them, the more that we can customize our experience to meet those needs. And that kind of moves into the second piece that I think that we need to focus on. The word tour really needs be stricken from our vocabulary. We should not be giving tours. We tour museums, we tour the White House, we shouldn’t tour a senior living community. We should provide a unique, meaningful, memorable experience for every customer who walks through our door because they deserve it first and foremost, but it’s also really good for our business when we do that, but we can’t do that once and until we understand what makes them tick. So, there’s a correlation between the depth of questioning that we provide. In other words, the more we know about our customer, the more we can get into those niche areas of our customer’s lives, the better we can provide a unique experience for them. And again, that’s what our customers deserves and it’s good for our business to do that as well, especially as you cited that they are making one of these five most important decisions. We need to get out of the business of touring and into the business of providing an experience. Mike: We need to look at people as individuals moving forward, and then we also need to embrace Dr. Wylde’s research. That research is certainly something that could be revolutionary in our industry if we choose to follow it, but it really speaks to the fact that we are selling a product that not only is going to effect that prospect, but it’s also going to affect their family members and we need to look at them as a family and embrace them in a much deeper level than before. We are only looking at 10 people at any one time and bringing our operational leaders in as well. That way we can serve our customers first and foremost, and that is where we need to live as an industry. I believe that if we take this approach, we can turn around the numbers. The tipping point that we’re at now, statistically speaking, we can begin to really turn this industry around, but we’re only going to do it by investing time in creating that relationship of trust one salesperson with one customer at a time. That’s our goal and that’s our mission and that’s where we need to be as an industry. Winston: Wow, great advice, Mike. I hope more communities and sales teams do heed your advice and shift the way that they sell. This has been phenomenal. And Mike Marlo, I cannot tell you how much I appreciate you being on the Senior Care Growth show. What a pleasure. What a great conversation. Winston: Awesome. Thanks so much everyone for listening. 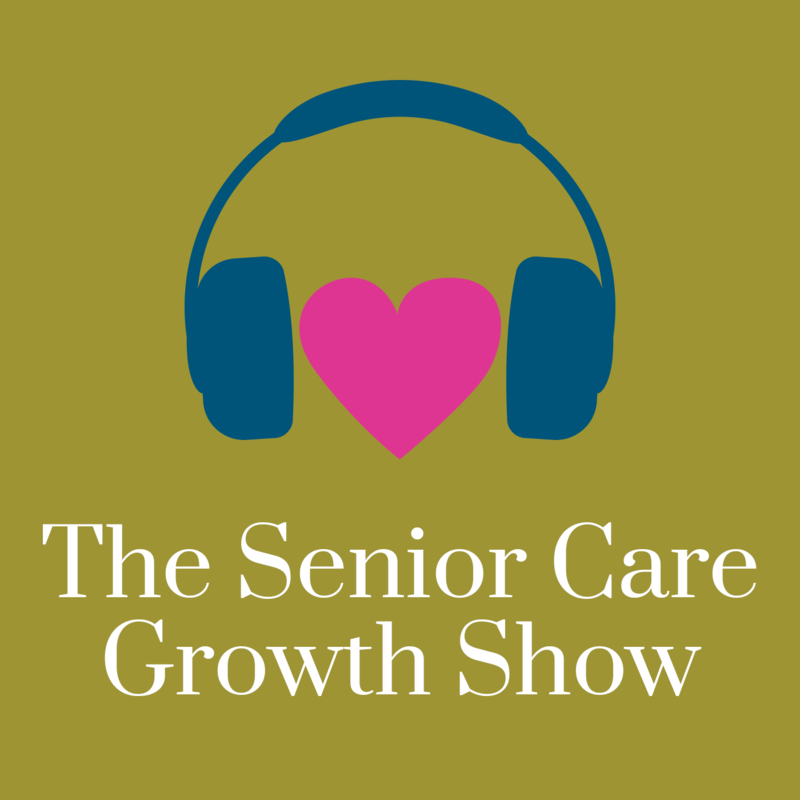 You’ve been listening to the Senior Care Growth show where senior care sales and marketing professionals come to grow. My name is Winston. Our guest today was Mike Marlo. Check us out next time. We’ll see you soon. Thanks a lot. Bye.